And so it begins! My love affair with all-things pumpkin, that is. The Fall season has so much to offer – cooler weather, spiced aromas, the changing of leaves…wait, who am I kidding? Changing of leaves in Florida? Okay, so maybe I don’t really get to experience that part of fall, having lived in Florida all my life. But I will this year! I’m moving to Greenville, SC before heading out on my epic trip to South America, and I can’t wait to experience a true fall. This morning felt like a bagel with cream cheese kind of morning, and that’s exactly how it turned out. With a side of eggs and strawberries, I might add. Sunday’s just deserve a nice hearty breakfast. 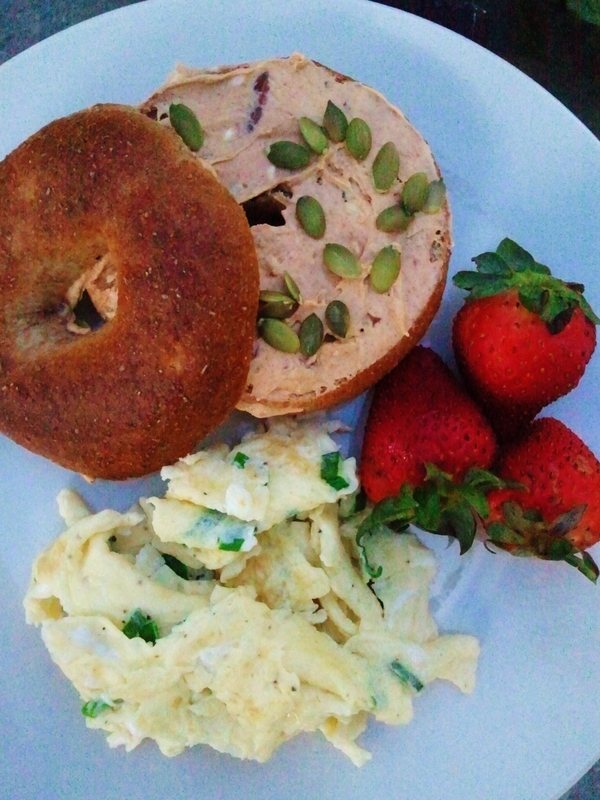 My homemade pumpkin cream cheese was a satisfying bagel topper and was very simple to make. 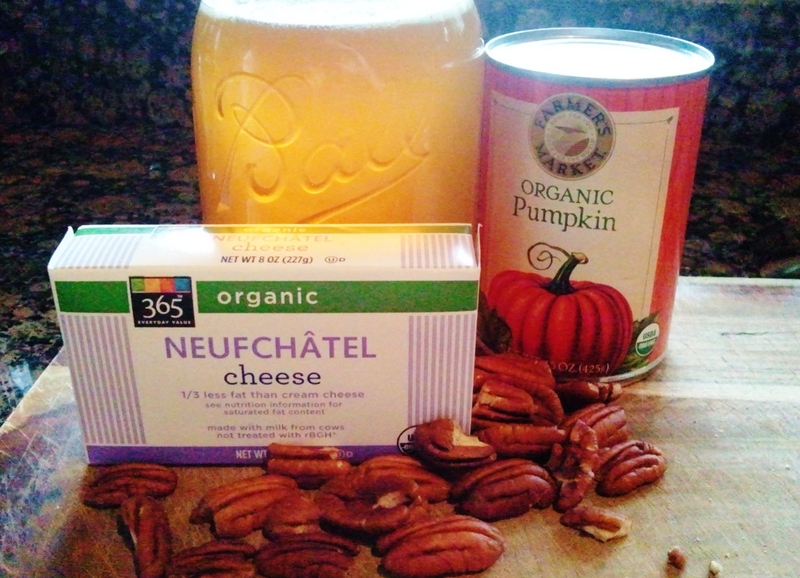 Rather than using cream cheese, I used Neufchatel, which has 1/3 of the fat found in regular cream cheese. But the reduced fat definitely wasn’t the deciding factor here; I’ve had Neufchatel before and I love that it has a soft and airy, almost “whipped” consistency. It wasn’t until I bought it myself that I noticed it had 1/3 less fat than cream cheese. The reduced fat content and higher moisture level is what makes it so wonderfully soft and airy. Mix this cheese with canned pumpkin, cinnamon, honey and pecans, and you’ve got yourself a tasty fall spread for bagels, crackers, toast and homemade seasonal breads. Using a blender or hand held mixer, first blend the Neufchatel alone to create a smooth base with which to work. 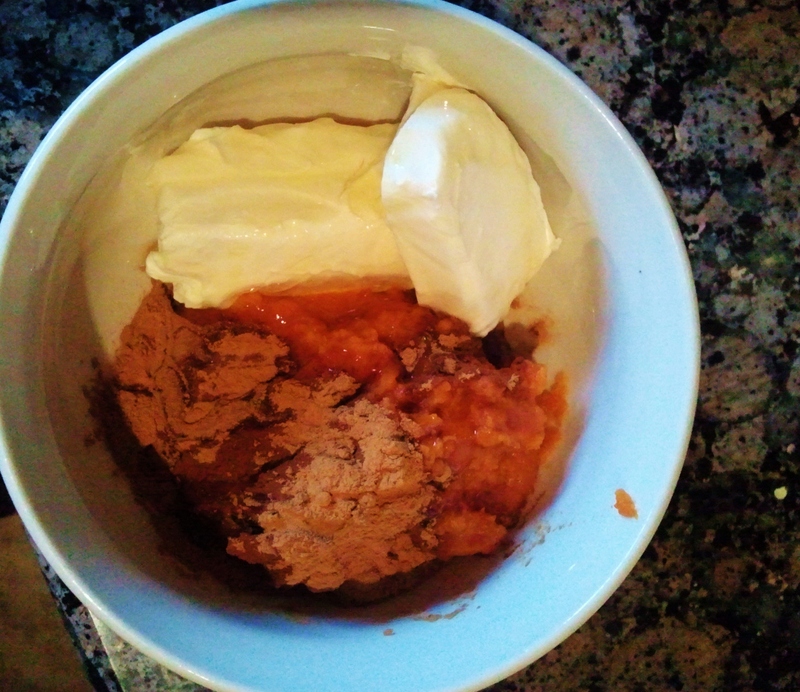 Then add the pumpkin, honey and cinnamon until well incorporated. You could also do this by hand with a spatula if you don’t have any mixers. Just be sure the Neufchatel is room temperature and soft to make it easier to fully combine all ingredients. 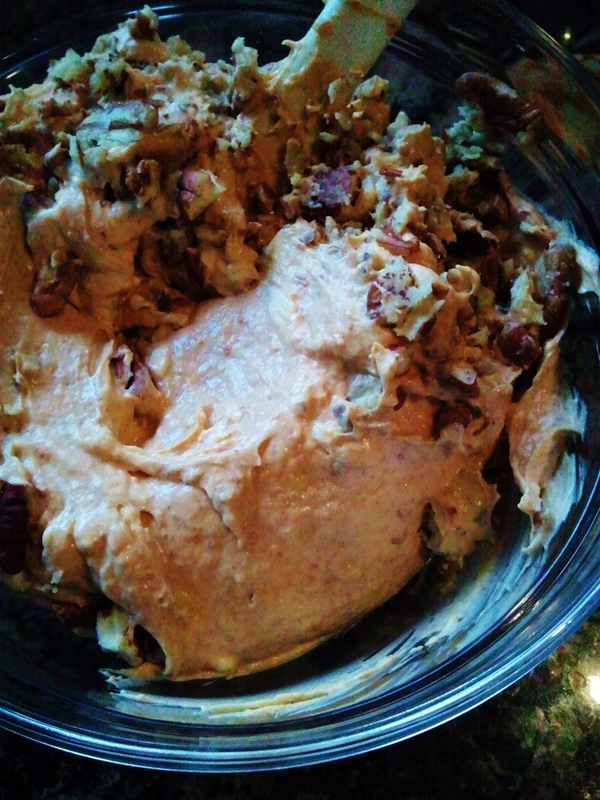 Place cream cheese into storing bowl and fold in pecans. Finally, spread and enjoy. Store the remaining spread in the refrigerator. For a little extra crunch and some color, I sprinkled pepitas on top.